Franz Marc was born in Munich, Germany in 1880; he had influence from his father, starting at an early age, as he worked as a landscape painter. At a young age of 20, in 1900, he began his studies at the Academy of Fine Arts, which was located in Munich, and was taught by several influential teachers at the time. Both in 1903 and again in 1907, he traveled to France, where he spent most of his time in Paris. Not only did he visit many of the local museums, he also got to meet with many of the artists in the area as well. During this time, he took much influence from Parisian art, and the artists which were most noted in the area. Copying the style which was used in the art forms he viewed, was a way for him to learn the different techniques, and a symbolic way to learn his own style in creation as well. While in Paris, Franz Marc responded enthusiastically to the works of Paul Gauguin, Van Gogh, Picasso, and the Expressionists; later, he was impressed by the Henri Matisse exhibition in Munich in 1910.In Paris, he also got involved with local artists, and many famous actors. 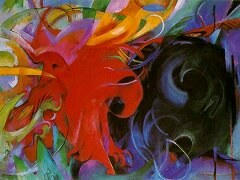 Not only did this allow him to gain more experience, and learn from their influences, it also allowed Franz Marc to draw many of his styles, and artistic forms from the works of individuals which he was around often. Not only did his style follow the Parisian style, he also took much influence from the location, and the pieces that he created, during this early phase of his career. 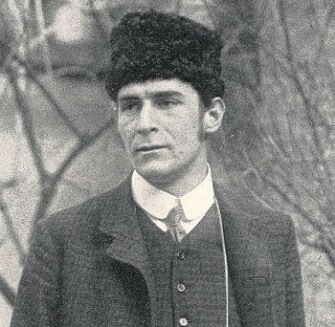 Although he was young during the peak of his career, this is namely due to the fact that Franz Marc lived an extremely short life, and died at the age of 36. He was married twice during his twenties, and was involved in stormy relationships during this period as well. In terms of his work, in 1906 he traveled with his brother Paul, to Mt. Athos, and several other Greek landmarks. This took shape in many of the pieces he created during this period of his career; in 1910, he also became acquainted with Auguste Macke, who not only had an influence on his work, but also his artistic style. 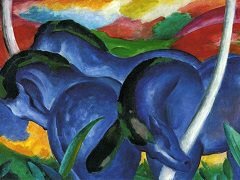 It was in 1911 that Franz Marc founded the Blue Rider Journal. It was also during this time that he, and the fellow artists (including Macke) who founded the journal, took on a Neue Movement (new artists's association). It not only depicted the works of new artists, but the new styles of art that were beginning to forge in Germany, and other regions of the world. 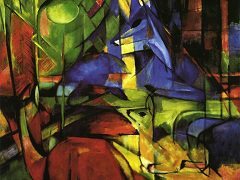 The exhibition which the journal held, featured many of the works which Franz Marc had created, between the periods of 1911 and 1912. 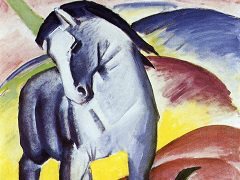 In 1912, Franz Marc met with Robert Delaunay, who used color and design methods, in a futuristic manner; this led to the futurist movement. Marc became fascinated in this futuristic style, as well as in cubism, and it became a major influence for the work which he produced during this year, as well as the work which came forth following this period as well. 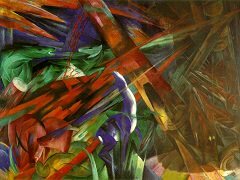 Stark works, and those which were extremely advanced for their time, including abstract nature, and bold colors and sharp angles, were some of the changes that were seen in the pieces which Franz Marc created, following the meeting he had with Delaunay, who introduced him to this new movement, and to this new style, that presented abstract, and new methods to present the same drawn out works of the past. During his career, Franz Marc created about 60 pieces in lithography and woodcut. Many of his pieces depicted animals, in their natural setting and habitat. The use of bold, bright colors were often seen in his works as well. He took a cubist approach, in the display and creation of the animals that he depicted in his works; simplicity was often seen as a means to his creative process as well, as most pieces simply focused on the animal, and the raw emotion, as opposed to drawing in from external factors, to create the printed art works during his career. Throughout his life, animal is a motif that Franz Marc always returns to, as artists have always returned to their beloved themes - Van Gogh his Self Portrait, and Monet his Water Lily Pond. He also gave meaning to the colors that were used in his pieces; blue was used to depict masculinity and a spiritual style; while yellow and lighter colors depicted femininity and joy. Red tones were often used to depict violence or some serious under toning in his work. 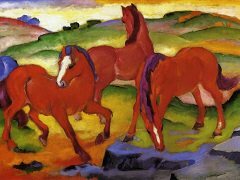 His works were oppressed by the Nazis in the early 1930s, and nearly 130 pieces which Franz Marc had created, were removed from exhibits, and art shows that he had become a part of, in different cities in Germany. 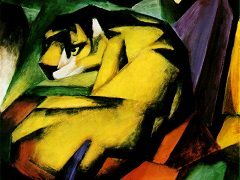 Although he died at the young age of 36, many of the pieces created by Franz Marc were influential, and well ahead of his time. Not only did they cause controversy in his home of Germany, the pieces he created also showed his extreme knack and ability to differentiate between color scapes, design, and unique images, using a minimal approach. The desire by the German wave of abstractionists to unite the new pictorial means from France with ambitious or transcendent subject matter, or both, quickly became the goal of subsequent movements of twentieth-century abstraction. While Marc was not alone in possessing lofty aspirations, he and Wassily Kandinsky, Paul Klee established a critically important step in making Cubist and Fauvist harmonies apply to an elevated concept of subject matter. For instance, the desire for the content of epic proportions became a touchstone in the work of Marc Chagall and Piet Mondrian, and then, among American Abstract-Expressionists Jackson Pollock, and Jasper Johns. 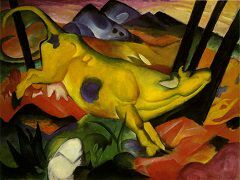 Not only was his work highly appreciated during his time, and extremely short career, but to this day, Franz Marc is considered to be one of the most influential painters to come out of Germany, for the unique style, and for the creative approach he took towards depicting the everyday in his work.